Over the past year, you have likely noticed how certain technological changes have affected your daily routine. These changes may seem mundane to you now. But I assure you they are not. In fact, these changes represent some of the most radical technological disruptions we’ve ever witnessed in the American economy. At Worm Capital, we continue to view disruption as the key to opportunity. This is where we have found the greatest potential for asset mispricing, outsized winners and losers, and opportunities both long and short. Looking forward to 2018, we see a moment in time that is both exciting, intoxicating—and potentially terrifying—for investors. Trillions of dollars of wealth hang in the balance. Often, but not always, we are seeing industries adopt a winner-take-all scenario. Who will be tomorrow’s titan? And who will be edged out of existence altogether? What business models will succeed tomorrow? Before deploying any capital, we typically spend months, if not years, monitoring and researching a given industry to gain an expertise. We seek a thorough understanding of the past, current, and potential future landscape to identify attractive opportunities—or challenges—we believe may exist. Currently, we focus on five verticals: Retail, cloud, television, energy, and transportation. This Investment Outlook serves as a broad guide for how we view the modern economy shifting not just in 2018—but in the years to come. E-commerce continues its meteoric rise while brick-and-mortar struggles and dies out. There are few changes in the American economy as dramatic, frightening and exciting than the rise of ecommerce and the decline of brick and mortar retail. In 2017 alone, there were at least 300 retail bankruptcies tracked by BankruptcyData.com. This includes RadioShack, Payless ShoeSource, and many other familiar names. The number of store closures this year were even more daunting. Since the start of 2017, retailers have either closed or announced closures at more than 6,700 stores across the United States, according to Fung Global Retail & Technology, a retail think tank. Credit Suisse has an even more dire prediction: According to an April research report, by the end of 2017, the bank estimates some 8,600 brick-and-mortar stores will close. As we look at 2018 and beyond, we expect to see more closures, bankruptcies, and a general departure from traditional modes of retail—fostering plenty of opportunities for short situations. For retailers to survive in this environment, they must radically rethink their retail environments, but it’s our view that many are terminally out of position. The reason for this shift is obvious, in our view:Consumer behaviors are migrating online, driven by the selection, trust, price transparency, and the ultimate ease of e-commerce—especially as more platforms begin to offer free shipping. We expect this trend to continue (and accelerate) in 2018. Right now, government data shows that e-commerce represents about 9% of all retail. 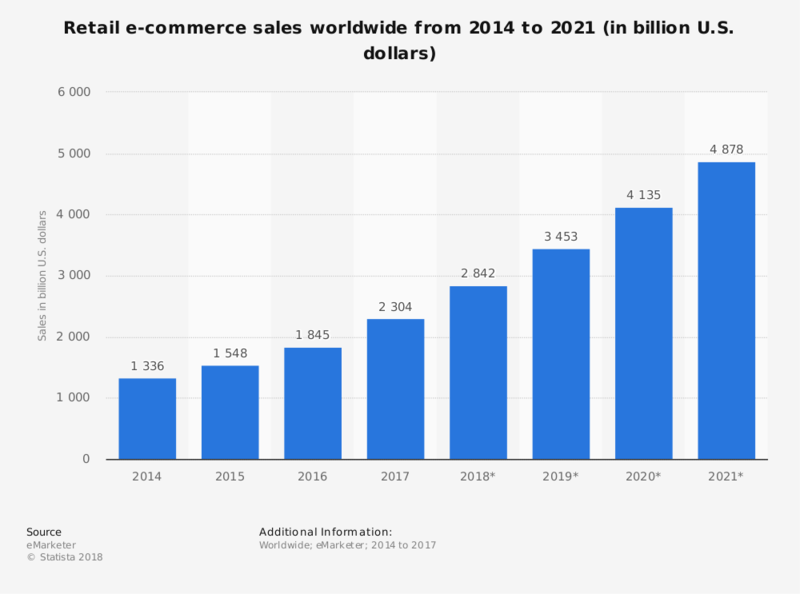 However, we expect this percentage to increase substantially over the next five years, creating an exciting and positive dynamic for online retailers who are not encumbered by expensive brick-and-mortar retail environments. We also have been monitoring the growth of ecommerce abroad, which represents a significant opportunity. Forrester predicts that China alone will reach $1 trillion in total online retail spending by 2019. While Amazon is the clear dominant force on the long side of online retail, we continue find opportunities on the short side, as well. For instance, we see particular inefficiencies in auto parts retailers, which are encumbered by several factors that heighten their exposure—including indefensibly high margins and a product set that’s being disrupted. The global shift to renewables is accelerating at a pace faster than previously anticipated. Disruption within global energy markets is roiling through dozens of industries and upending centuriesold ways of doing business. We are at the inflection point. From here, there is no turning back. Over the last several years, we have seen how the energy mix has shifted, largely driven by technological improvements and environmental concerns. Ten percent of all of the electricity generated in the U.S. in March came from wind and solar power, marking the first such milestone in U.S. history, according to a U.S. Energy Information Administration report. By 2018, Tesla’s Gigafactory will "reach full capacity and produce more lithium ion batteries annually than were produced worldwide in 2013," the company says. In October 2017, wind power sources from 28 countries in the European Union (EU) set a new record: they provided 24.6% of total electricity — enough to power 197 million European households. In Europe, some estimates predict wind capacity will exceed coal capacity in 2018 . As long-term investors, we’re not interested in the shortterm concerns of oil prices and inventories. The future we see is driven by complete sustainability—wind and solar farms, as well as Gigafactories producing lithiumion batteries for the mass market. This is just getting started too, with trillions of dollars at stake in numerous energy-centric verticals. Of course, it’s embarrassing to be virtually the only nation on earth against the Paris Climate Agreement. But we expect the reaction (and the push to renewables) to be strong beginning in the 2018 elections. By 2020, we expect politicians to be completely behind renewables. The following years we expect to see the beginning of a massive transformation. According to the Union of Concerned Scientists, the aggregate national economic impact associated with health impacts of fossil fuels is between $361.7 and $886.5 billion, or between 2.5 percent and 6 percent of gross domestic product. From an investment perspective, the move to renewables represents an extraordinary business transition—an uprooting and replacement of decadesold dirty energy production. This transition could yield hundreds of thousands of jobs, and will be a major benefit to the the economy. As an investor, you need to see changes in advance and get in position. Internal combustion engines will become obsolete, and we will quickly shift to automated, electric cars. The rise of automated, electric cars is happening faster than you might believe. The are a number of factors influencing the shift from internal combustion engine (ICE) to electric, but perhaps most prominently it’s the fact that batteries are getting cheaper—and the cars will ultimately be much safer. In September 2017, we spoke with Tony Seba, a clean energy guru, Silicon Valley entrepreneur, and Stanford lecturer. Seba’s most recent study on automotive disruption, “Rethinking Transportation 2020-2030,” makes the fascinating argument that by 2021, oil prices will collapse, electric vehicles will go mainstream, and that by 2030, about 95% of the U.S. population will be served by electric, self-driving vehicles. Interestingly however, Seba—like us—posits that incumbents (GM, Ford, etc.) will not lead the charge to electric vehicles. Rather, it will be a handful of upstarts— including Tesla—that will come to dominate the transportation industry. We asked Seba why that is, and we think his answer illustrates the problem effectively. “It's about the inability of the incumbent to make a transition,” he told us. “It's essentially about them being addicted to the existing business model, to the cash flow that it generates, and not seeing that it's going to dry up—and it's going to dry up very quickly. Right now, there are several projections of electric car adoption rates over the next 20 years. On one hand, for instance, OPEC says electric vehicles will make up just 1% of all cars on the road by 2040. Bloomberg New Energy Finance, on the other hand, says it will be closer to 33%. 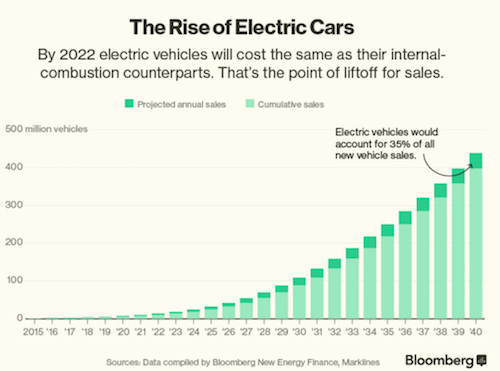 We resist making quantitative assessments on specific, future adoption rates, but it’s our view that electric cars will continue to proliferate rapidly as consumers recognize the long term value and cost-savings of owning a fully-electric vehicle. Streaming video will quickly displace modern cable networks, while VR and AR will grow rapidly. The days of ad-centric, linear, top-down cable-packaged television are quickly coming to an end. Good riddance. We believe the future of television—and much of entertainment for that matter—is shifting to Internet TV. The new mode of viewing allows for more choice, freedom, and it’s all direct to consumer. In the age of disruption, value proposition always wins. We welcome the age of cord cutting—and we expect this trend to continue. The numbers are indeed staggering. In 2017, a total of 22.2 million U.S. adults will have cut the cord on cable, satellite or telco TV service to date — up 33% from 16.7 million in 2016 — according to research firm eMarketer. Earlier in 2017, Variety reported that by 2021, the number of cord-cutters will nearly equal the number of people who have never had pay TV — a total of 81 million U.S. adults. That means around 30% of American adults won’t have traditional pay TV at that point, per eMarketer’s revised forecast. This is new territory—and it’s also a premier example of winner-take-all paradigm shifts as platforms consolidate and create huge amounts of content for a market that increasingly wants to watch all of it upfront. Now, 73% of US consumers admit to having binge watched television and the 90% of Millennials and Gen Z that binge watch are propelling the trend, according to research from Deloitte. Over one-third of Millennials and Gen Z are binge watching weekly, and on average, they will watch 6 episodes or about 5 hours of content per sitting. We’re also bullish on new modes of entertainment, from virtual reality to augmented reality, which remain in early stages—but growing rapidly. The mainframe is dead. Long-live cloud computing. Back in 2012, Worm Capital made a prediction: That the rise of cloud computing would ultimately lead to the death of the mainframe. This would not be a sudden death, but the move from on-premise to centralized (cloud) is happening as anticipated. Our investment thesis remains intact: Most of the computing functions remaining today as we know it will migrate to the cloud over the next 10 to 15 years. There is still enormous opportunity for investors. In the not-too-distant future, we believe most business managers will realize that on-premise computing makes very little economic sense. First, typical data center usage rates are only about 15%. Second, traditional mainframe computing is bad for the environment. The potential death knell for on-premise computing is that it’s multiples “dirtier” than operating the cloud. As a contrast, Amazon’s AWS claims that by 2020, it will run on 100% renewables. Mainframes require an enormous amount of power to run. The reality is that even the most energy-efficient data center can have a significant carbon footprint because they are typically getting 70 percent of their electricity from greenhouse-gas-emitting fossil fuels, like coal, according to Forrester Research. On the other hand, cloud lends itself to more environmentally friendly because large masses of data centers can be hooked into dedicated wind or solar production centers. It is hard to exaggerate just how significant this disruption truly is. Gartner, the global research firm, has predicted that by 2020 the "Cloud Shift" will result in more than $1 trillion in IT spending. “This will make cloud computing one of the most disruptive forces of IT spending since the early days of the digital age,” they note. For long-term investors, the appeal is obvious: Traditional technology incumbents (including Cisco, IBM, and others) are stuck with legacy business models, selling switches and mainframes. Meanwhile, upstart innovators are forging ahead, creating massive wealth for owners and shareholders. Consider the chart below—revealing that they have been left behind by a handful of technology upstarts. Disclosures: Worm Capital, LLC does not accept responsibility or liability arising from the use of this document. No document or warranty, express or implied, is being given or made that the information presented herein is accurate, current or complete, and such information is always subject to change without notice. Shareholders and other potential investors should conduct their own independent investigation of the relevant issues and companies involved in this article. This document may not be copied, reproduced or distributed without prior consent of Worm Capital. Arne Alsin and Worm Capital clients are currently long Amazon (AMZN) and Tesla (TSLA) stock and call options, and also own put option positions in IBM and are short the stock and stand to benefit if the trading price of Amazon or Tesla increases and/or the trading price of IBM decreases. The opinions expressed herein are those of Worm Capital, LLC and Noel Perry and are subject to change without notice. The company (or companies) identified or referenced herein is an example of a current or potential holding or investment target and is subject to change without notice. This information should not be considered a recommendation to purchase or sell any particular security. It should not be assumed that any of the investments or strategies referenced were or will be profitable, or that investment recommendations or decisions we make in the future will be profitable. Past performance is no guarantee of future results. Worm Capital reserves the right to modify its current investment views, strategies, techniques, and market views based on changing market dynamics. This article contains links to 3rd party websites and is used for informational purposes only. This does not constitute as an endorsement of any kind. Worm Capital, LLC is an independent investment adviser registered in the Investment Advisers Act of 1940, as amended. Registration does not imply a certain level of skill or training. More information about Worm Capital including our investment strategies, fees, and objectives can be found in our ADV Part 2, which is available upon request. WRC-17-29.